Home AI Market ResearchEnabling Technology & Infrastructure AI Today Podcast #31: AI and Blockchain — Double the Hype or Double the Value? 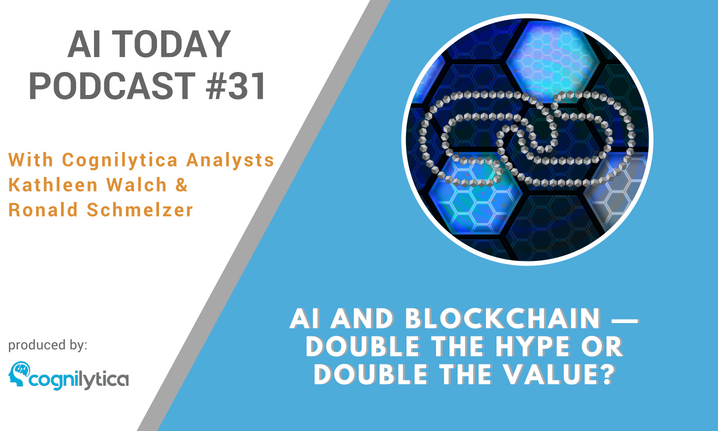 AI Today Podcast #31: AI and Blockchain — Double the Hype or Double the Value? One of the other trends making the news and getting lots of attention is Blockchain. Proponents of blockchain claim that it will have fundamental, ground-breaking impact on all industries, changing the way that we transact with one another. Blockchain will enable greater degrees of transparency, trust, and decentralized control where governments and companies can’t own or manipulate the data at their will. Sounds profound! Surely, blockchain would have some impact on AI and vice-versa? In this podcast, we talk a bit about Blockchain from our AI-centric perspective, and talk about the ways in which AI can impact and influence blockchain, and ways in which blockchain will be able to add value to AI. Or perhaps this is all just double the hype? Let us know your thoughts as well!